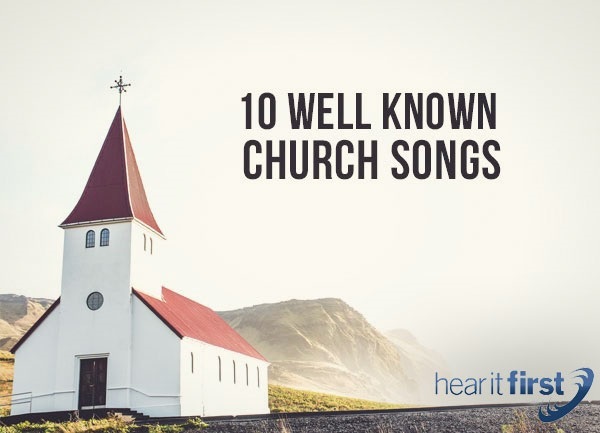 Here are ten of the most well-known Church songs. The song, Amazing Grace by John Newton, is the most well-known, well-recognized Christian songs in history. If there is a rival to this song in popularity, it is so far down the list that, at best, it is a distant second. John Newton, before conversion, was one of the most ungodly of people there were, being insubordinate and often in a state of drunkenness, but also in the slave trade business. Most of us would have thought he’d be the last person on earth to be saved, but something happened. In 1748, a storm tossed his ship so violently that he thought he was going to die, so he cried out to God for mercy and was sparred and became one of the strongest Christians in history. The song Amazing Grace was actually written to illustrate a sermon on New Year's Day of 1773, but when it appeared in print in 1779, it was used during the Second Great Awakening in the early 19th century, and today, it still remains the most familiar church song there is. Robin Mark’s, Days of Elijah, has been one of the most popular Church songs in the last fifteen years. Mark is a Northern Irish Christian singer, songwriter, worship leader, and recording artist based in Belfast, Northern Ireland, and the story behind the song is quite interesting as Mark says that he attended a lot of Brethren or Gospel Hall meetings as a small boy and somehow the theology of Old Testament stories and characters who were ‘types’ or ‘examples’ of Christ and the Church got stuck in his head. One of his main points was that God is still in control, as He has always been. Even though Tim Hughes wrote the song, Here I Am to Worship, it was Michael W. Smith that made it popular from his album, Worship Again, and today it is one of the most recognized songs in Christian music, but is also one of the most frequently sang songs in churches today. It makes the perfect opening song for services as it’s a call to worship God, so this makes it one the most perfect songs for church worship services. The lyrics included “Here I am to worship. Here I am to bow down. Here I am to say that. You’re my God,” making it perfectly suited for any worship service. The classic church hymn, How Great Thou Art, was written by Carl Boberg, and is a church song that you could possibly hear at any church, with God-glorifying words such as “When I in awesome wonder. Consider all. The world Thy Hand hath made. I see the stars. I hear the rolling thunder. Thy pow'r throughout, The universe displayed” so, no wonder God’s greatness causes his soul to sing, “My Savior God, to Thee, How great Thou art!” So perfect is this that the sun, the moon, the stars and yes, even the rolling thunder declares God’s great power and glory. The song, Mighty to Save, by Rueben Morgan and Ben Fielding, focuses on the God Who saves those who don’t deserve it, with such powerful lyrics as “Everyone needs compassion. Love that’s never failing. Let mercy fall on me. Everyone needs forgiveness. The kindness of a Savior. The hope of nations,” as they proclaim of God, “He can move the mountains. For my God is mighty to save. He is mighty to save.” You could possibly hear this song in nearly any church across America. Jeannie Lee Riddles song, Revelation Song, was first released by Kari Jobe but was made popular by Philipps, Craig, and Dean, is such a powerful worship song, not only because of the beautifully stirring music, but with lyrics that praise God by singing, “Worth is the Lamb who was slain” Who is “Holy, Holy, Holy, Is the Lord God Almighty, Who was, and is, and is to come” and to us, He is our everything, “And I will adore You” in worship and in song. Revelation Song will almost compel you to worship the great Lamb of God, Jesus Christ. In Christ Alone by Keith Getty and Stewart Townend has been called a Christian Creed song because it focuses on salvation by faith in alone in Christ alone (Act 4:12), and for which the believer can have “No guilt in life, no fear in death” because “This is the power of Christ in me” as “The wrath of God was satisfied. For every sin on Him was laid” and so “Here in the death of Christ I live.” We love to use this song during worship services because it glorifies God and gives Him full credit for our salvation, which of course he utterly deserves (Eph 2:8-9). Jesus, Friend of Sinners, was written by Mark Hall and Matthew West but is best known as being sung by Casting Crowns. This song has been called a “pop hymn,” meaning that it’s a recognizable church hymn but highly popular today, as it peaked at number 1 on the Billboard Soft Adultt Contemporary/ Inspirational chart, No. 2 on the Billboard Christian Adult Contemporary chart, No. 6 on the Billboard Hot Christian Songs, and on the Hot Christian AC charts, but also at No. 20 on the Christian Contemporary Hit charts. This song means very much to the new Christian as their being saved from their sin is still fresh in their minds. Early in 2015, Casting Crowns released their CD, Until the Whole World Hears, and on it was featured the highly popular song Praise You in the Storm, but it was originally released in 2006 and was a heartbreaking song about a Erin Browning, who died of cancer, so this song not only has the lyrical theme of maintaining faith through difficult circumstances, but one where a person is even able to praise God in the storm. This is reminiscent of Job’s proclamation amidst great loss and suffering, “Though he slay me, I will hope in him” (Job 13:15). This is a great song to worship with when you are going through a storm in life. Perhaps I have left out one of your favorites that you think should be on it. If that’s the case, please leave us a comment and add it to our collection so that we can see what we missed. There are so very many that I could have included, like Amazing Grace (My Chains Are Gone), Forever, Open the Eyes of My Heart, Forever Reign, How He Loves Me, Come Now is the Time to Worship, The Stand, Hosanna, Lord I Lift Your Name on High, and so many more. I believe these are also among anyone’s list of the most well-known church songs.